Aware of the competitive environment that Instanet Solutions exists in, our approach was many pronged when it came to updating the Instanet Solutions brand and website. In addition to implementing a robust Social Media, Marketing Automation, and CRM strategy that integrates with both the web, social media and internal processes, 108 ideaspace provided marketing strategy, new company branding, a new website and ongoing community management. The website was redesigned to reflect the progressive and accessible Instanet Solutions products and the power of their integrated suite. We focussed on user experience, design and accessibility in order to highlight Instanet Solutions’ outstanding products and services. The branding overhaul and website re-design, as well as the content and functionality optimization that was done for Instanet Solutions has had a significant impact in a number of ways. 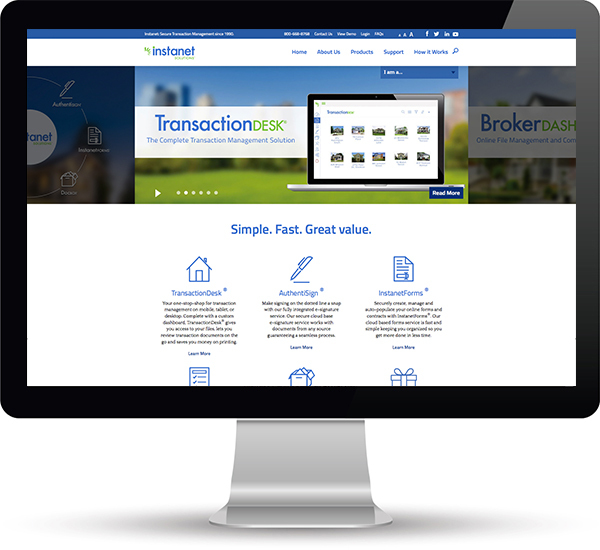 The Instanet Solutions brand and website now reflect the company’s status as a leader in innovation in the real estate software industry. In addition, the restructuring of the website and implementation of strategic elements has significantly amplified lead generation for Instanet. Moving forward, we will be providing ongoing community management with the aim of continuing to grow and engage the Instanet Solutions’ audience.